Many thanks to Lisa Yungel who saw our Oregon Trail pages and sent these images and text! Our trip moves east to west and you are seeing much of what the emigrants saw in the same order. 1. This panoramic picture was taken on the top of Windlass Hill before entering Ash Hollow. The reddish strip of grass on the right side of the picture is the grassy ruts of the Oregon Trail as it winds it's way across the ridge; you can walk along these ruts for a few miles in either direction. While the descent down Windlass Hill was considered scary by the emigrants, due to the slope of the hill, they were willing to risk crashing their wagons, losing belongings, and breaking bones in order to take advantage of the spring, shade & beauty of Ash Hollow. 2. 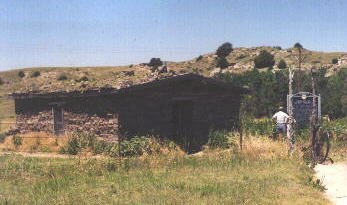 There was a sod house or "soddy" at the edge of Windlass Hill in Ash Hollow. While this is not the original, it is built on the original site of a soddy that was often used by the emigrants as a makeshift post office. Emigrants would leave letters & money for postage at the house for relatives back in the East and hope that some eastward bound traveler would take it "back to the States" with them. 3. This rock formation was appropriately named Chimney Rock; even though what the pioneers saw was about 100 feet taller than what is pictured, we can see how Chimney Rock got it's name. 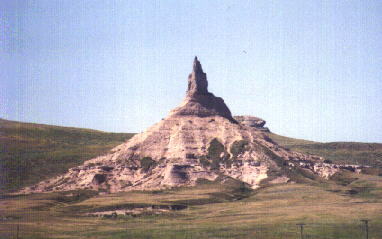 Chimney Rock was the landmark that is mentioned in more emigrant diaries than any other landmark along the Trail. Emigrants were so fascinated by it that they made side trips just to climb it and place their names as high up on the Rock as possible. Unfortunately, Chimney Rock is made of a soft sandstone and the names on the Rock eroded after only a few years. 4. 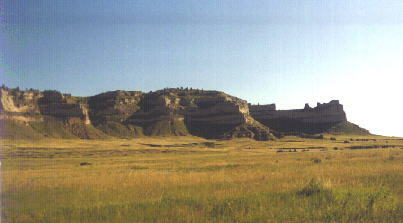 As the emigrants approached Scott's Bluff, this was their view. By now, however, they were used to these unusually shaped landmarks, although the area surrounding Scott's Bluff was often referred to as "the gardens" because of it's beauty. 5. 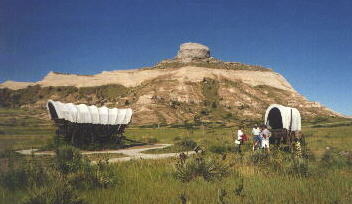 In Scott's Bluff National Park are two examples of the types of wagons used on the great trails west. The wagon on the left is a Conestoga wagon, which was rarely seen on the Oregon Trail but quite common on the Santa Fe Trail. The wagon on right is the type of wagon used on the Oregon Trail; these wagons were smaller than the Conestoga wagon. Can you imagine trying to fit your most valued possessions on a prairie wagon like this one and travelling over 2000 miles across the country?